Christmas crafting has begun! I am so excited to be working on Christmas crafts. I will be honest and tell you that I start up with the Christmas stuff much earlier than I really should. If you are one of those people who does not like the stores to put up decorations until after Thanksgiving, then you don't want to be involved with me. I like to start early! Which brings me to these Santa Sticks that I made, ahem, right after Halloween. It has taken great restraint not to post them until now! Do you remember these sticks from early in the year? 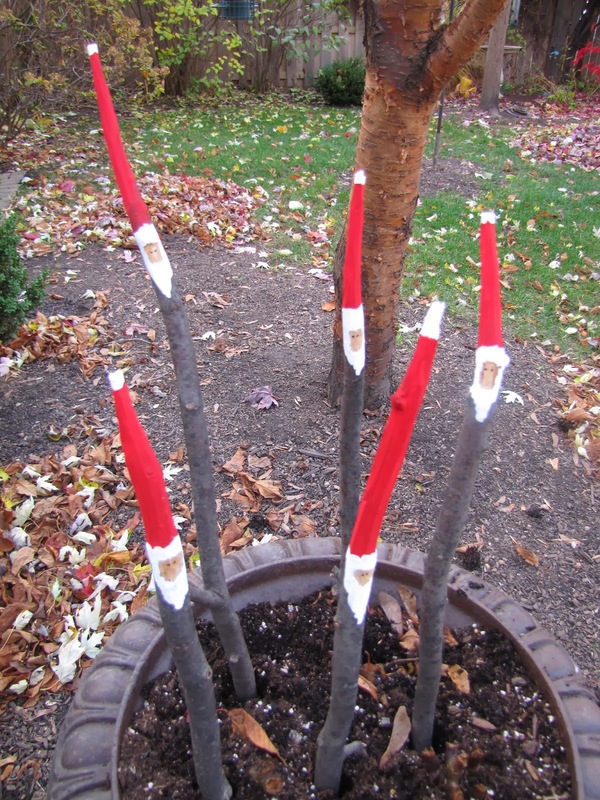 The Santa Sticks are my "holiday sticks"! 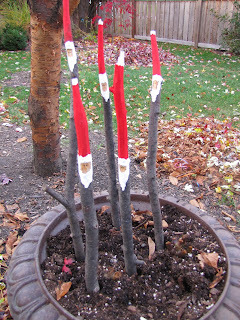 Ha Ha, who knew I would need seasonal sticks for my backyard. Good thing trees always need to be pruned because my son's stick "collection" is dwindling very quickly! Once I get the evergreen branches in the urn I think they will look a little more at home. They are a little lonely right now! These were so easy to make. I just whittled the tops a little bit to look like Santa's hat, and I carved a little bark off for the face. Then I painted them up to look like Santa. For the face I just put two tiny black eyes, I'm not sure you can see that in the photos. I had a hard time getting these bad photos, sorry. Have you painted any sticks for your yard yet? c est une très bonne idée, je vais m'en inspirer pour ma terrasse et mon entrée à noel.